The Prime Minister says combating climate change will be the defining characteristic of her term of office. Ms Ardern sees this question as being more urgent than all other economic, environmental and social issues – even the alleviation of child poverty, to which she is headily committed. How did this topic gain this ascendancy? The Green Party and many left-wing Labour voters support the PM’s priorities. They fear the effects of human-caused global warming will likely create existential problems by the end of the century. They say, and probably believe, that their forebodings are based on “The Science”. It can only be the latest report of the Inter-Governmental Panel on Climate Change (IPCC) – issued in 2013 as “Assessment Report #5” (AR5). Not the “Summary for Policymakers”, which is itself written by policymakers, but the report written mainly by public sector scientists and known as Working Group 1 (WG1). This is the “official” resource available to Governments. WG1 makes predictions regarding average global surface temperature levels in 2100, given certain postulates regarding the atmospheric concentration of greenhouse gases (GHGs) by that time. Four postulates are used, ranging from very low to very high, and the feared existential threats flow only from the high concentrations. How real is the highest postulate, known as RCP8.5? This is an important question (for another article) but not one that is answered by The Science. The scientists of WG1 do not even look at that question, but leave policymakers to answer it for themselves. The scientists’ key role lies in deciding the axioms, assumptions, hypotheses and data that are fed into the 116 computer models in the Coupled Model Intercomparison Project – Phase 5 (CMIP5) in the World Climate Research Program (WCRP) coordinated by the World Meteorological Organisation (WMO). The hardware, OS, software, structure, etc., of this project are largely determined by IT specialists (not scientists). Each coupled land-sea model runs multiple simulations of future climate effects and the outputs are interpreted by scientists. What is the climate sensitivity? Defined as the temperature increase caused by a doubling of the parts-per-million of CO2 in the atmosphere (e.g., from 280 to 560 ppmv). The immediate impact is a rise of about 1.1°C, but what are the net feedbacks caused by that rise? Nobody knows, so scientists use Bayesian techniques to estimate likely levels and publish their probability distribution analyses (PDAs). AR5 cannot report a “best estimate” because there is huge disagreement regarding the value of equilibrium climate sensitivity (ECS) as between recent published research (<2°C) and CMIP5 simulations (>3°). This stand-off is yet to be resolved. What is the effect of natural variability? If human-caused GHGs increase temperature levels by a 10th of a degree, while a La Nina simultaneously reduces them by two 10ths of a degree, the result is global cooling, not warming. Back in the 1990s, the IPCC thought variations like the El Nino Southern Oscillation (ENSO) would cancel out, leaving just the human impact to drive long-term changes. But the “long term” (undefined) might be centuries and, in the meantime, the climate models are unreliable predictors – in both theory and practice. The IPCC thought natural variability might be so minor that the models could afford to ignore it, and looked for “fingerprints” which could distinguish human-GHG-caused radiative forcing from other influences. WG1 scientists sought evidence in the data for the period from 1958 (when suspected human causation first became detectable) to 1998 (when a giant El Nino dominated the data). They hoped to prove that anthropogenic forcing caused 90% or more of observed warming “in the second half of the 20th century”. The project proved impossible, largely because the major driver theoretically attributed to humans is feedback, which has no fingerprints. AR5 fell back to estimating that “more than half” of the observed warming was caused by human GHG emissions combined with “other anthropogenic forcings”. SPM.3, a table of likely causes, is based on “observations combined with climate model simulations”. This attribution is highly unsatisfactory. The claim that humans cause considerable global warming is not based on evidence or research but on opaque simulations by problematic models that have never been validated. The logic is perfectly circular – the models are reliable because there is very little natural variability which we know from the models! In summary, the basis of the “dangerous anthropogenic global warming” narrative is not “The Science”. The vital questions assigned to scientists are “how much?” and “who?” but neither of these questions has been answered by application of the scientific method. There have been no real-world experiments nor successful predictions. Neither the calculations nor the outcomes of models can be falsified or replicated (even if one has a coupled model at hand), and there are no peer-reviewed journal papers to evaluate or criticise. 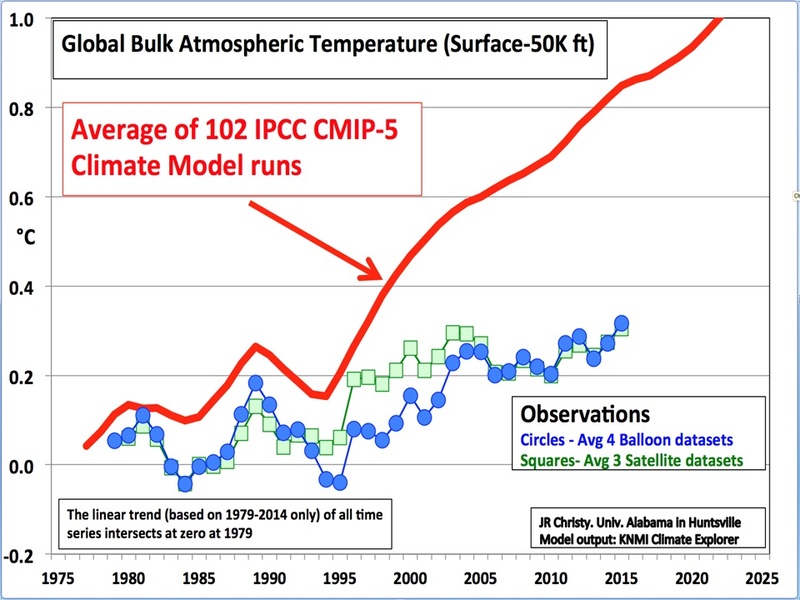 The key questions have not even been addressed by humans, except in the sense that the modellers have voted in an IPCC meeting or questionnaire. We have opinions in lieu of evidence. Whenever an interested scientist asks for evidence, there is a choreographed response: “there is overwhelming evidence” somewhere else; or “97% of scientists already agree”; or “we don’t debate with deniers”. No URL, nor library reference nor even common sense dialogue ever ensues. So the Prime Minister can’t blame The Science. The carefully chosen warnings in the IPCC’s SPM documents are crafted by politicians and bureaucrats, guided by highly skilled and very expensive spin doctors. The media just love alarm and virtually live on weather stories. Groupthink takes hold and alarm goes viral within various demographics and tribes. “The Science” is reduced to a mantra, rather than the pinnacle of rationality it once rightly claimed to be. After alarm becomes a political platform, the scientists re-enter the arena. Now they address the question of just how bad things might become in terms of human and environmental health IF (a) RCP8.5 should prove probable; and (b) ECS should prove 3°C plus; and (c) natural variability should prove minimal. This is the domain of the IPCC’s Working Group 2 (WG2) – where scientists are in the minority, but certainly play a role. In New Zealand, the role of amenable scientist has been taken up by the Royal Society, which has issued a booklet, Human Health Impacts of Climate Change for NZ. This benign document should surely ease the anxiety of the Prime Minister. The worst we need fear is a need to gradually adapt, and there are no existential health disasters in store. My plea to Ms Ardern: let’s follow the advice of the Prime Minister’s Chief Science Advisor and have evidence-based policy decisions. What’s happened to the science advisor for the previous National government, Professor Sir Peter Gluckman? He made many dire predictions of the dangers we face due to climate change although I believe his expertise was in pediatrics. Sir Peter is still ensconced there, hasn’t been replaced. Christchurch City Council workers are claiming that sea level rise rate has doubled in recent years . This is based on some misleading numbers from the draft MfE report on coastal hazards. Andy, I should say that the Christchurch developments are intolerable. What is the man in the street to do? Even selling up will be at a new, rock-bottom price. This man in this street is willing to publish your own version of events, if that appeals to you. I’m holding fire on the ChCh issue as it seems to be very “fluid”. i.e no one seems to know what they are doing. I’m glad to be out of it to be honest. I’ll keep you posted though. Going by the comments on the Stuff article – Jacinda Ardern interviewed by Al Gore – quite a few folks aren’t convinced that AGW is the great problem of the century. Thanks, Maggie, I tried to watch Gore’s video that’s lodged in that article but it quickly became hard going. I just couldn’t face another hour of that much misrepresentation. Yes I’ve noticed that the comments under climate change articles have been getting very sceptical for a while now. You can see when the pro AGW commenters arrive they usually do it in groups which tends to suggest it’s a weak organised push-back from greenie activists. I’d say the battle for public opinion has been lost by the alarmists and there’s nothing they can do to rectify it. It’s true that the public have had a gutsful. Unfortunately the government sees things differently and are restricting building in coastal areas on the basis that the RCP 8.5 scenario is “likely”. Until we know more, the precautionary principle applies. It is ironic that those who suggest that uncertainty is an argument for doing nothing are invariably older and will not have to contend with the consequences of their inactions. I don’t usually drill down on Simon Says stuff, but this time I elected to. Silly waste of time really. Only the abstract was available to a penniless cherry grower. That said, a coupla key phrases and ideas emerged from the abstract which require challenge. …. conclusion: the models are stuffed full of nonsense. Garbage in, garbage out. Across-model relationships between currently observable attributes of the climate system and the simulated magnitude of future warming have the potential to inform projections. …. conclusion: If we take an average of garbage we should get um better garbage. we show that robust across-model relationships exist between the global spatial patterns of several fundamental attributes of Earth’s top-of-atmosphere energy budget and the magnitude of projected global warming. …. conclusion: based on the fallacies of the preceding assertions, Show me the data before I believe your final conclusion. Skeptical is science. Also note that the authors’ mean estimate of Equilibrium Climate Sensitivity is 3.7°C which is on the high side of previous estimates. Those pesky empirical temperatures must be wrong & the models right, or maybe you could get really desperate and try to use an El Nino as evidence of AGW again in lieu of any genuine warming. Climate models – good luck with that, try consulting the horoscope oracles & see if that helps as well. Maybe one of you would like to comment on why 2017 will likely be the third warmest year in recorded history behind 2016 and 2015 despite being La Niña conditions. The ten warmest years in order will be (NOAA data) 2016,2015,2017*,2014,2010,2013,2005,2009,1998,2012. Note that the massive 1998 El Niño event ranks only in 9th place. Why? Easy: it would have been warmer than the other years. But you cannot seriously aver that 2017 was one long La Nina, and you leave out the fact that 2016 was an El Nino. Doesn’t that matter? But we wait on the observations, don’t we? Can you say how much warmer 2016 was than 2015, 2015 than 2017 (clearly impossible yet), 2017 than 2014 (clearly impossible yet), 2014 than 2010, etc.? Magnitude matters, friend. When temperatures are only a few hundredths of a degree Celsius apart, they are effectively identical, which also occurs at the top of a curve, so they might be about to come down. 2017 – after effect of the El Nino as temperatures return to pre El Nino conditions. None of the high temperatures in those 3 years are attributable to AGW, they are a result of a well known natural weather phenomena. The giant 1998 El Nino cooled faster when it finished as it was followed closely by a strong La Nina. The current weak La Nina conditions were only officially met last month & have yet to have any impact. It should also be noted once again that El Nino are cooling events as the ocean purges heat to space via the atmosphere. Thanks, Magoo, well said. I’m working on something else but I meant to say exactly that. Heh. Richard, if you go to the BoM ENSO page, http://www.bom.gov.au/climate/enso/indices.shtml and then select the Nino 3.4 graph you will see that for most of 2017 things have been neutral with a little flirtation with El Nino mid year, before making steady progress through the -0.5 barrier into true La Nina territory. New Zealand is atypical when it comes to what we might expect during a La Nina event. We have our hottest summers over all and west coast drought conditions are more than probable at this time, which is what we are seeing now. I find it very disappointing that the likes of NIWA are missing the boat looking for reasons to blame humankind for what is obviously a natural phenomena. Just by looking at what has happened in my part of the country via local data spanning nearly 90 years and comparing that with the status of the ENSO I predicted our last two severe droughts in 2012-13 & 2013-14, six weeks before NIWA finally came out and called them! I alerted people to the strong possibility of drought here at the start of October when it was still sopping wet everywhere!. We have just had our driest Nov on record (just beat out 2012 by 1mm!). The patterns of Anticyclones to the south & south-east of New Zealand are classic La Nina patterns. NIWA would have more success following this line of enquiry, and be of more use to New Zealanders now. Although rare, hot Decembers are not unprecedented, but may people under 40 years of age would not have experienced one in our area. So far the usual sources haven’t claimed this as being as a result of CAGW that I have noticed, but they must be tempted. Informative comments, Ian. Thanks for your insight. I was not attributing garbage to Nature , rather to climate models. It’s unverified models all the way down, just like the turtles holding up the planet. Different models project different amounts of warming primarily because there is not a consensus on how to best model many key aspects of the climate system. That statement epitomises the blindness of your faith. This new paper on sea levels shows that sea levels at Yemen, Mumbai have been fairly stable over the last 100 years. It’s true, then. The inmates are running the asylum. Richard, the inmates have always run this particular asylum. During my teenage years, our city council in Palmerston north built a system of levees out on the plains to contain future flooding then promptly sold sections to create a new housing suburb within the levee. Of course, in the fullness of time the area experienced massive rainfall. To protect farmland from flooding (the original purpose of the levees) a councillor authorised the blasting of the levees with gelignite which earned him the unfortunate nickname ‘jgelignite jack’ used by furious owners of suddenly flooded houses. It seems that the set of civil servants has always and will always be a subset of highly educated idiots. An outrageous tale, but thanks. Re the MfE publication and “they claim that sea level rates have doubled over the 20th Century”. This nonsense is probably based on the switch from tide gauge measurement during 1900 – 1992 to satellite altimetric measurements during 1993-99. Not only unscientific, this Michael Mann-type “trick” is downright dishonest. The tide gauges used pre-1992 continue to measure relative sea levels at specific points up to the present time. They show a steady 1.7mm per annum with no acceleration at all. The satellite measures began in 1993 at 3.2mm but they show no acceleration either. “Doubling” occurs only if these two datasets are spliced together. Splicing datasets that measure different and incompatible phenomena is a classic schoolboy howler. It yields no useful information whatever. Tide gauges measure RELATIVE sea levels as between water and land. Satellites measure a NOTIONAL (ie having no direct counterpart in the real world) absolute level of EUSTATIC sea levels. Nobody has been able to show any reliable correlation between the former and the latter. Fortunately, the MfE and local authorities don’t need to understand satellite altimetry. All they need is hard data for the particular coastline that concerns them. Dr Lewis is impressed with the statistical technique of identifying high-performance “predictors” which are then used to grade the CMIP5 models. However, using the same method as Brown and Caldeira, he shows that the most skilful predictor field (OLR seasonal cycle) shows a negligible uplift (3%) rather than the 15% claimed in the press release. He notes that “the dominant contributor to intermodel variation in climate sensitivity is differences in low cloud feedback” and finds that the biases of earlier model generations are not well correlated with the biases of CMIP5. The inability to quantify low cloud feedback remains the Achilles heel of the orthodox IPCC approach. Nic may be correct. That is a debate for people who know more about the subject than ourselves. The important thing to note is that all experts agree that the ECS is at least 1.5C and many are suggesting that it may be >3C. That doesn’t mean that acceleration can’t happen though. The Greenland ice sheet is losing mass fast and the irony is that will affect our part of the world more due to the change in gravity. Yeah, Simon, those “experts” again. “Experts” telling us that the Earth’s atmosphere prevents the oceans from becoming totally frozen solid. ….those “experts”…eh. There follows a little repercussion about this comment which is revealed here…..
Simon as usual repeats garbage. The last 19-20yrs has seen no statistically significant increase of Temp.. The quoted increases, in thousandths, are worthless non-facts, useful only to deceive. Why are we not surprised. “Equilibrium” climate sensitivity, not “Earth” CS…..whatever. Have you checked the PSMSL web site for proof that they adjust the data? It is my understanding that they accept data “as is” from the various sources. If the data has been adjusted it is probably down to the sources, not PSMSL. Andy, I don’t disagree with you, nor did I intend to be overly critical. By asking if you had checked for proof i.e. asked how PSMSL treated the data it received, I was asking if you had looked for any mention on the PSMSL site about data handling. When I see claims from papers like the one you cited I like to endeavour to check the backgrounds to the claims. Not always accomplished, I regret to say. In this case I had quite a long email conversation with John McLean who wrote that he could find no evidence to suggest that PSMSL manipulate data. I agree with him. Indeed, the PSMSL data is so widely used that had the information it presents been manipulated I rather think we would know about it from other sceptics! Hannah (2015) sets out all the numerous adjustments that have been undertaken on the Wellington, Christchurch and Dunedin tide gauge data for periods prior to the mid-1980s when measurements became a bit standardised. Auckland data also needed adjustment, but Prof Hannah feels that this record is both reliable and important. “Since 2000, vertical land motion at the Auckland, Wellington, Lyttelton, and Dunedin tide gauges have been monitored using continuous GPS measurement (cGPS) techniques. While this data is currently being prepared for publication (Denys, personal communication), they indicate that general tectonic motion, earthquakes, and slow slip seismic events have had, and are continuing to have a significant impact. At Wellington, for example, there is evidence of a regional subsidence in the order of 3 – 3.5 mm/yr upon which uplift due to slow slip seismic events is superimposed. No corrections have been applied to any of the tide gauge data for these effects”. If recorded seismic events have had a significant impact since 2000, we can safely assume that they had a similar, but unrecorded, impact on the 20th century local sea level data. In its worst winter for over 40 years, 48,000 Britons have died of the cold. “Globally, twenty times as many people die from the cold than from the heat. This is exactly the case in Britain, where cold-related mortality accounts for 61 deaths per 100,000, one of the highest rates in Europe. This compares with only three deaths per 100,000 for heat-related mortality. Minimum requirements for home insulation in England appear to be dreadfully inadequate. About two years ago I looked over a new home as it was being built in Devon. Barely 90 mm insulation and a 20 mm cavity behind a thinnish stone facade backed by 100 mm breeze blocks. At least the windows are tiny, compared to places such as Holland, Germany and Belgium. In Holland, windows are now often triple glazing, which they need, I guess, because the windows are huge in relation to the overall size of the dwellings.